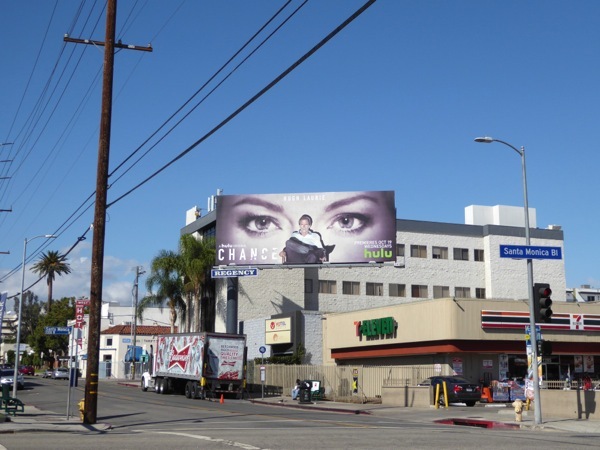 These days it feels like if you look away for an instant, when you turn back there's another whole slew of TV shows vying for your attention be it on network TV, cable, online, or via a variety of streaming services (and of course in the skies of L.A.). 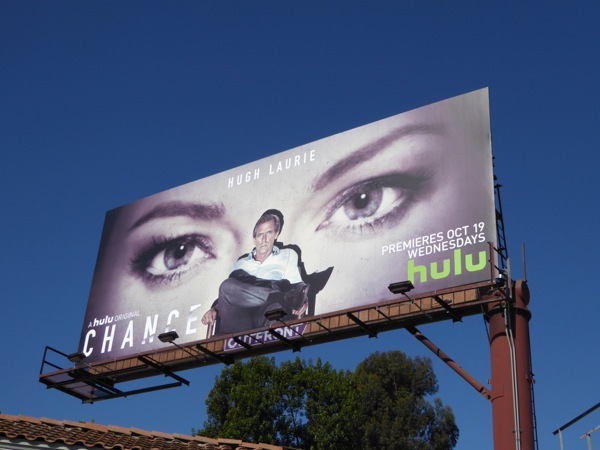 To try and grab your attention with their latest scripted offering Hulu has enlisted Hugh Laurie, of House fame, to play 'Eldon Chance', a forensic neuropsychiatrist living in San Francisco (based on the novel by Kem Nunn). 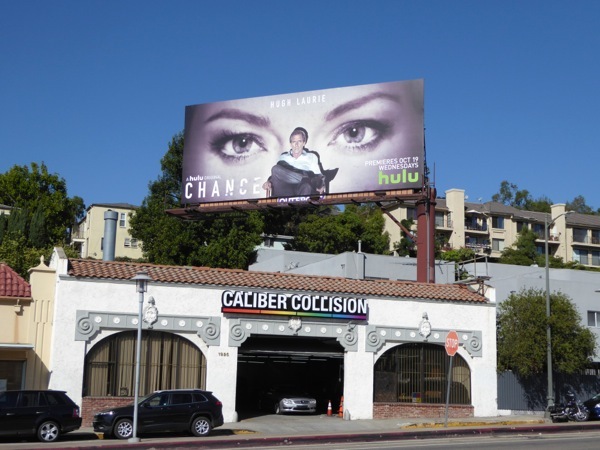 In the show Chance becomes entangled with battered housewife 'Jaclyn Blackstone', played by Gretchen Mol, who has an overtly sexual alter-ego named 'Jackie Black', and is drawn into a world of mistaken identity, mental illness and police corruption. 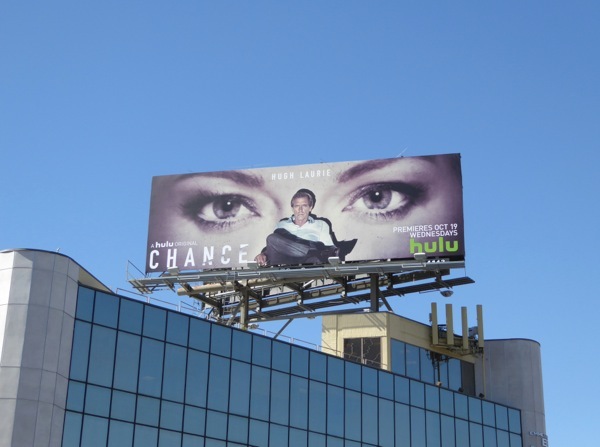 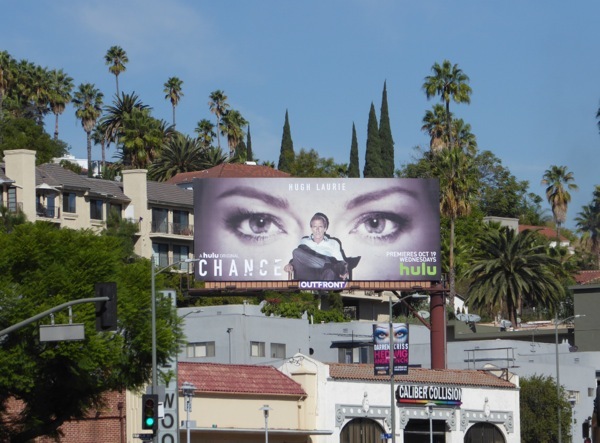 These series launch billboards for Chance are certainly eye-catching, especially when you fall under their gaze, and were spotted along Cahuenga Boulevard, Santa Monica Boulevard and above San Vicente Boulevard from October 8 through October 20, 2016. 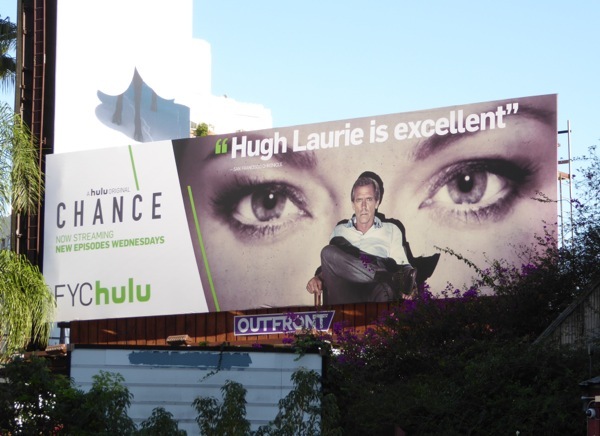 Plus for more billboards with Hugh Laurie, be sure to also check out this outdoor ad campaign for The Night Manager mini-series. 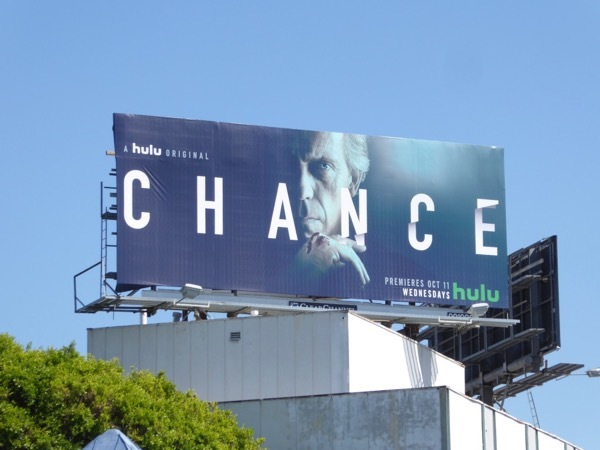 Will you be taking a chance on Hulu's new bingeable suspense thriller this Fall, or like Daily Billboard are you struggling to find time for the sheer deluge of programming that's assaulting us on a daily basis in this new age of television? 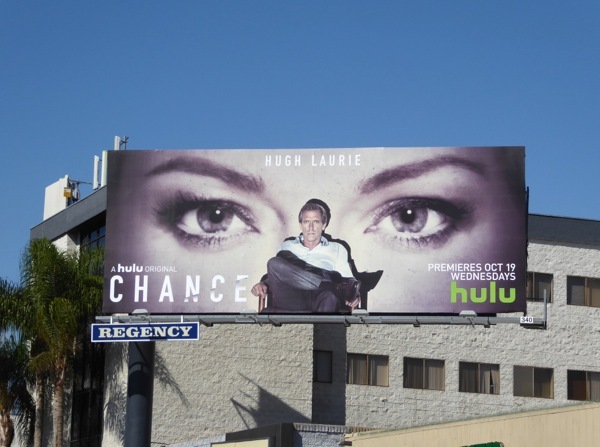 UPDATED: Awards season is upon us and here's a billboard from Hulu's For your consideration ad campaign for Hugh Laurie and Chance, snapped along West Hollywood's Sunset Strip on November 14, 2016. 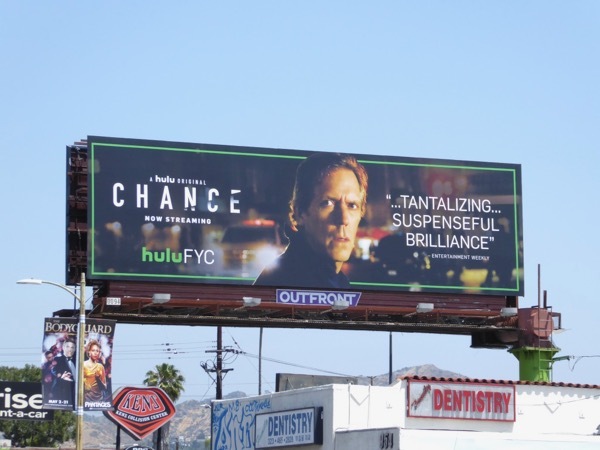 UPDATED: Here's also the Emmy consideration billboard for Chance, with a close up of Hugh Laurie's face, snapped along Hollywood's Vine Street on May 11, 2017. 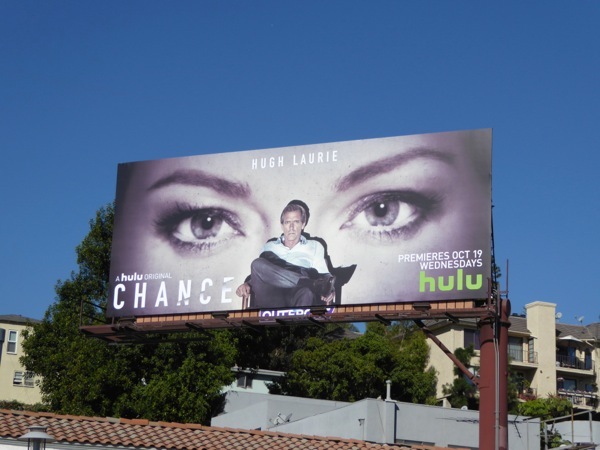 UPDATED: Hugh Laurie returns to the skies for the sophomore season of Chance with this billboard spotted high over Beverly Boulevard on October 4, 2017.